Santa Ana High School classmates Esmeralda Osorio (left) and Noeli Zarate (right), show off the gold medallions they received along with their $40,000 Edison Scholars scholarships. Esmeralda Osorio (left) and Noeli Zarate (right), two 2016 Edison Scholars, compare their medallions during a reception honoring this year's 30 scholars. Three 2016 Edison Scholars gathered for a celebration at Edison International headquarters after winning $40,000 scholarships for college. Sun Hyuk Ahn (right), a senior at Quartz Hill High School, takes a selfie during a reception honoring the 2016 Edison Scholars. Six 2016 Edison Scholars celebrate winning their $40,000 scholarships during a reception honoring their awards. MIriam Melendez (center with gold medallion), a senior at Polytechnic High School in Long Beach, enjoys a reception for this year's 30 Edison Scholars. Melissa Torres, a senior at James A. Garfield High School in Los Angeles, will use her $40,000 Edison Scholars scholarship to study computer science at UC Irvine. The 2016 Edison Scholars pose with SCE President Pedro Pizarro during a recent reception in their honor. Thirty high school seniors are honored at an Edison Scholars reception. Each student will receive a $40,000 scholarship. Esmeralda Osorio started referring to her house as “Hotel Osorio” after her mother fell on hard times and rented out two bedrooms to her brother’s family. That left the five in Esmeralda’s family crammed into the living room. So Esmeralda took great interest when her family decided to remodel their garage into two bedrooms. 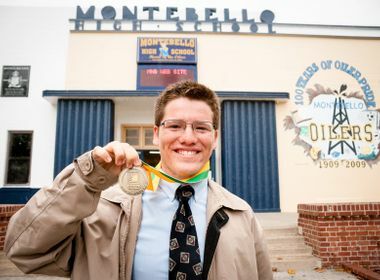 The Santa Ana High School senior studied every facet of the project, helping hands-on by painting. That experience inspired her to become a civil engineer. “I want to give back to my community where many families like mine live in bad conditions due to economic problems,” said Esmeralda, who is the first person in her family to go to college. Esmeralda was able to celebrate the occasion with her high school classmate Noeli Zarate, who also won an Edison Scholars scholarship. 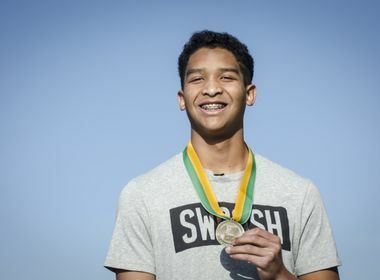 Santa Ana High School was the only school to have two Edison Scholars this year. Noeli wants to major in computer science and civil engineering at UC Irvine. Her goal is to plan buildings that can provide health care to underprivileged communities. Ultimately, she wants to own her own company. “I want to be an engineer because engineers make people’s lives better,” she said. Esmeralda, Noeli and this year’s other 28 Edison Scholars faced stiff competition in winning the coveted scholarships. More than 930 high school seniors applied. Students had to demonstrate financial need and plan to major in science, technology, engineering or math (STEM). 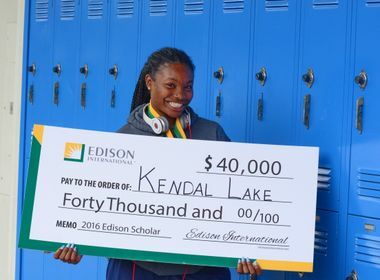 Since 2006, Edison International has awarded $6.5 million in scholarships to 550 students. SCE President Pedro Pizarro congratulated the scholars on their accomplishments, noting the STEM majors they plan to pursue will produce the skilled workers Edison needs to adapt to the dramatic technological challenges facing the utility industry.